There are some conflicting views on the issue of giving cats a bath. Usually there is no great reason to bathe your cat especially a short-haired indoor cat. Cats spend a large percentage of their days grooming themselves by using their rough, barbed tongues. To remove dirt, odor and the elements, they lick dirt and debris off their fur. Long-haired types may require the occasional bath if their fur gets too oily from climate conditions and the individual tendency of the skin of the cat. Breeds of hairless cats like sphynxes, should have a weekly bath, because their skin can get greasy and dirty. A bath for a cat may be a necessary experience if they get into some dirt or oil, or have an unfortunate encounter with a skunk, heaven forbid! It’s actually a myth that all cats do not like to be in water. Well, I suppose there are cats out there that will never allow a bath, but interestingly so, there are some that will accept the occasional bath and some that actually love it. Below are some basic preparation and steps to bathing your cat. Your choice in cat shampoo will depend on the needs of your cat. If it has ultra sensitive skin and coat, a vet prescribed product may be in order. It is wise to follow the directions carefully. Make sure to use a good quality “tearless”, cat shampoo to prevent irritation on your feline’s body or sting his/her eyes. 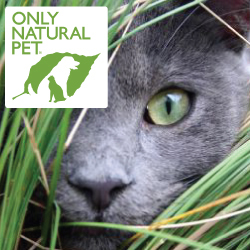 A good product is Only Natural Pet, Easy Defense Herbal Shampoo which is safe and gentle. Fill the sink or tub with approximately four inches of warm water. Be sure to check the water temperature before placing kitty into the bath as you certainly don’t want to burn your animal friend. Catch your cat! A cat who enjoys baths will no doubt cooperate and will go willingly into the bathroom, or wherever you are choosing to clean up. On the other hand others who are new to the procedure will be terrified and try to flee, sensing that something’s up. It’s best to be in a room with a door that closes to prevent an escape in a soapy, sudsy form. And remember to keep your cool, speaking softly and sweetly, so as to not stress out your cat. While using both hands with a firm grip, gently and slowly lower your cat into the basin. Meowing and yowling at this point are normal. Just continue moving forward. If you would like to cover the cat’s ears with a kitty shower cap, and the cat will tolerate it, it can be put on before wetting the cat. Thoroughly wet your cat’s fur, avoiding your the face as much as possible. The saturation should be down all the way to the skin of the animal. At this point, gently apply some, not too much, shampoo on the skin and begin to rub and massage it into the fur creating a good lather in the process. You may want to use a soft toothbrush for a deeper scrub if needed. After a thorough lather and wash, it is now time to rinse off the suds. This can be achieved with using warm water poured out from a pitcher or by using a hand-held faucet nozzle with mild pressure. Thoroughly rinse off all of the soap. Do not leave any residue. If you do not completely rinse the cat from the soap an irritation could flare up on the skin, causing stomach problems. As a final cleansing step, you may want to wash your cat’s face. This can be simply done with a warm wash cloth without any soap added. A gentle motion will give him or her a stimulating massage. And it goes without saying that you should never spray you cat’s face with water or solution, or force dunk any cat’s head or face under water. After the above steps have been completed remove your sparkling clean feline from the basin and wrap him or her in a clean warm towel. Make sure there are no drafts and there is adequate heat. Blow drying your cat’s fur is an option, but runs a risk of scarring the animal with the noise from the machine. Safely blow dry on a low, low setting, to prevent burns on the sensitive skin. It’s best to skip this all together if the entire bathing episode has been a trying one for the cat. Once your feline buddy is completely dry, give him or her a nice brushing or combing of the fur. It is perfectly normal for the cat to start licking its fur immediately after you’ve finished all your hard work! Bathing one’s cat is not for everyone. Keeping calm is key to help your furry pal through the process. Talk in a soothing, sweet voice of reassurance. This will help you get through the steps and will create a positive experience to allow future bathing. Introducing the bathing ritual at an early age also makes things easier for an adult cat. What happens When Boredom Strikes? You get unhappy, energy built up, hyper cats! That’s what I have encountered many times with my cats, who are indoor/outdoor cats. When they are unable to go outside due to the weather or in my absence there seems to be a planned mayhem. Crazy running and rants are underway, yowling of discontent or frustration (they are all spayed and neutered), scratching with intensity on their posts, antagonizing each other, starting fights, begging for food without any real hunger, the list goes on and on. What does a cat guardian do in this situation? Yes, there are lots of toys that can be used for distraction, as any cat owner has in their arsenal. But cats have a tendency of getting bored. They need interactive toys if you are not able to play with them. As I have blogged before, I am “all-in” when it comes to an interactive toy on the market. One Fast Cat Exercise Wheel marries the interaction play and the exercise needed for a cat. It can be used by all ages of cats, and any size or weight up to 25 pounds. That is quite a range and a great selling point for those that have many cats ranging in age, breed, and size. The One Fast Cat exercise wheel is of distinction in this category because of a number of points. It is easy enough to assemble it by one person. It’s wheel is covered with protective EVA foam that is a practical and comfortable cushion for cat’s paws. There is longevity and design improvements in the product, since it’s launch in 2014. The designers, OneFastCat.com of the exercise wheel put a lot of thought into the physics, mechanics and convenience of the entire package. Now, there are those that will choose to make their own cat exercise wheel, unless you have the know-how, the materials and the time, the onefastcat wheel is a lightweight product made of recycled plastic. It is a reasonably priced item, and easy to put together. As this strange, large object may be daunting for an animal at first, there are ways to entice your reticent cat to jump in and on the wheel! If you have a cat that is not sure how to keep the wheel going you can use a laser light for it to chase or its favorite toy to jiggle a vit higher up on the wheel. Seeing an item that is worth chasing will enact the cat into running and the wheel will start spinning. Some cats know what to do right off the bat, others are not so sure. Each cat can go at it’s own pace either at a high speed, leisurely walk or anywhere in between. The cat will either jump off when done or stop moving it’s legs. Watch the videos below to see some cat’s reaction to the wheel. The One Fast Cat wheel has been on the market for a couple of years and is now in its 4th generation of production. So this is good news for consumers. This exercise wheel is being fine-tuned over a period of time. As noted in the video (watch above) parts to the wheel are larger and wider for less construction, and prevention of wheels coming off the track. Sean, the creator/designer of the product is very much involved and is found in one of the videos in this blog. So as a buyer one can have confidence in this product as being safe and good entertainment and exercise for your cat family. Do you own a One Fast Cat Exercise Wheel? What is your review of this products? Leave your comments below. If you are going to rescue a cat that you see running around your area, you are going to need a safe way to trap it, both for you and the animal. An effective and humane trap is the Advantek GFA Catch & Release Animal Trap sold at Tractor Supply. This fully assembled trap that measures is ideal for containing stray cats, but also can be used to rescue raccoons, woodchucks/groundhogs, opossums, armadillos, and other animals in this weight and size range. It is a great deal with its bonus small trap that comes with the larger trap. These dimensions are best suited for catching and releasing chipmunks, squirrels, flying squirrels, rats and weasels, for relocation of the animal. Having had the experience of capturing feral, and non-feral cats, I have found that this trap is just what I needed to get the job done. It has a step trigger in the rear of the cage. I entice the animal with food in the back area of the vessel, and the release works well to slam shut without a possible escape or injury. The design of the trap, with its smooth edges prevents harm to the animal, which is what is preferred when catching a scarred animal such as a stray cat, that needs to be rescued and re-homed. Storing the Advantek live animal trap is also easy enough, as it is lightweight enough to hang on a shed or garage wall through one of its mesh openings. Cleaning it can be done by hosing it down and letting it drip dry or pad it down with a rag. I have not experienced this item to rust in any weather. With its lifetime warranty, I don’t have to worry, although it has proven to be very durable and is thus a great bang for your buck! I know I will be using mine for many years to come, for my cat rescues. Have you rescued a cat to re-home or keep as a new family member? The Advantek Live Trap may be for you! Leave your comments below. Does your cat seem restless or is it becoming overly vocal? If you have experienced these behaviors with your cat and others listed below, it may have an issue with anxiety. It can be a real problem as animals are also known to suffer from the pressures of daily life. We have only to look at zoo animals to understand the issues of anxiety in non-human species. It is something to be taken seriously for the health of your animal family member. Below is a list of behaviors that your feline can exhibit if it has anxiety. If you have ever had an anxious attack, you know how unpleasant it can be. Relating that scenario to you cat is helpful in trying to find the best way to treat the anxiety. Eliminating the cause of the anxiety is the key to helping your cat, and preventing more severe trauma. It can manifest as severe depression, and it can develop into behavioral problems. Since your cat cannot communicate the problem, begin to investigate by making a list of what triggers anxiety in humans. The same things that stress you out could be the same for your feline. Like you, a cat can be prone to stress from changes in routine, uprooted situations, being left alone too long, or with the addition of a new animal family member, or the loss of one. Although, it can be a long process to find out the root cause of the stress for your cat, your feline family member’s health should be a high priority. Some approaches to try include, using different toys for stimulation, and different diets for better nutrition. Maybe altering your activity schedule away from home is necessary as well. The following is a partial list of what the causes could be. Ultimately, your cat’s well being rests in your ability to help it through its anxiety. Persistence is key to rule out any underlying cause. Medical intervention through your veterinarian may be needed such as a calming medication. However there are other products on the market that can be used to help calm your cat such as calming collars, calming mists, anti-anxiety supplements, calming cat chews, stress-relief coats, and natural remedies, such as catnip. Like humans, some animals are naturally prone to stress and some have serious struggles with past traumas. These cats may need the assistance of a veterinary behaviorist or anti-anxiety medications prescribed by a veterinarian. Be aware of behavioral changes in your feline to ensure that it is happy and healthy.